It’s summer time! My favourite time of the year. It’s also the time of the year when a lot of people have a break from playing table tennis. This is completely understandable. The weather is good. People want to be outdoors and do other activities. Often people are away for holidays. And some people just like to take a complete break from playing table tennis for a while and the summer seems the best time to do it. But…. (you knew there was a ‘but’ coming)… if you really want to get an advantage over your clubmates and your opponents, now is the time to keep practising! I have always liked practising in the summer. Clubs tend to be quieter, so I get more table time. The new league season is only a couple of months away, so I have a goal to keep me focused. It always seems like a good opportunity to get in some quality practise. I think it’s one of the reasons I always tend to start a league season quite strong. I use the summer months to get into shape. Quite simply, if I put in more practise hours over the summer compared to others (who may not practise at all), then I will sharper and in better form when the league season starts. But it’s not just about turning up and putting in the hours. I try to use the summer months to really practise with a purpose. I work on areas of my game which will make a difference when the league season starts. This could be working on a strength and making it even stronger. Or it could be working on a weakness – something which is losing me points when I play. I have a pretty decent service game, but when under pressure I don’t think I generate as much spin as I know I can. And there is a big difference between a low serve with loads of spin and a slightly bouncy serve with less spin. The spinny serve can give opponents real problems. The bouncy serve can get punished. So my challenge over summer is to serve with heavy spin every time (unless I’m purposefully doing a no-spin serve). My forehand topspin has always been a strength. But at times it can get stiff and jerky and then the shot is not so good. So I am working on smoothing out the technique. 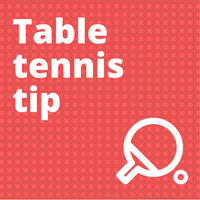 Trying to loosen my shoulder, elbow, wrist and grip and getting a good twist when playing a topspin. I have been working on this ever since I had a coaching session with Eli Bararty back in February. Some days I have it and the shot feels great – more spin and speed. Other days it gets a bit stiff again. So it’s a work in progress. My backhand has always been my weaker side and for my first few years of playing it was a major weakness. But I have improved it a lot over the past 3-4 years. It is no longer terrible. Probably just average. My goal over the summer is to get it a bit better than average. This means trying to play my backhand topspin with more speed and spin, but maintaining high levels of consistency. I will be working on these three things whilst doing regular and irregular drills. And I will also do lots of match-play (my favourite method of training) where my goal will be to execute my serve, forehand topspin and backhand topspin in a way similar to how I do it in drills. So now I switch the challenge to you. How will you fit table tennis into your life this summer? Make a plan and develop some goals. What strengths do you want to make stronger? What weaknesses are you going to improve? Now is the perfect time to practise and gain an advantage over your absent clubmates and opponents. Practise hard and when they return in a couple of months, you’ll be sharp, they’ll be rusty and you’ll win many more points. Great post Tom!. Here’s my summer goal. My summer goal is to learn to play against pimples and choppers better and put it into matches if I can. I’ve always found it hard to read the spins on balls and stop the more modern defenders from making an attack. There’s also not many good practice partners who can do both ok and who want to spend the time playing with someone of a lower league standard. Any tips Tom? How do you practice against things like this yourself. Great question. Many people face a similar situation – they want to improve against pimples players but don’t always have the opportunity to practise with a pimples player. I guess I was quite fortunate when I started out. I had many defensive players at the club I went to, so got plenty of opportunity to practise against pimples. And I enjoyed the challenge, so I would seek them out. The only way you will really improve against pimples players is to practise with them (and use the right tactics – read this article for some tips). Best thing to do is keep asking anyone who has a pimples bat to practise with you and you’ll soon start improving. Thanks Tom. The Tips helped me understand a bit better. Going to be a long time until I understand how the pimples work and how to judge the spins i think. Thank you Tom. Very nice guide, I really like your tips about the backhand consistency.